Anyone with a sustained interest in cocktails inevitably collects a few books. Some of us find pleasure in the obscure, letting a beat-up vintage tome transport us to another place and time. Such was the case last holiday season when we were presented a gift of several old cocktail volumes. One of them entitled Prelude to Pleasure by Ogden Nash was published in 1934 as a 1000 copy limited edition for the Continental Distilling Corporation of Philadelphia. What made this book so intriguing wasn't the poetry or the dated photos and kitschy line art—it was the handwritten recipe on the last page. 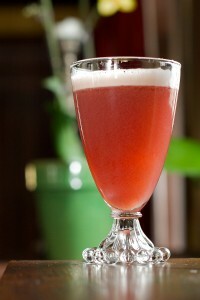 Back in March I posted a recipe for the Sloe Gin Fizz. If you haven't had the pleasure of tasting this drink, or more importantly, tasting real sloe gin, I highly recommend making a little room in your cabinet for this wonderful spirit. Do everything you can to find Plymouth Sloe Gin since other brands may not be the same product. Some people say that the best sloe gin is homemade, and that's probably true. Just be aware that many of the bottom shelf brands have nothing in common with blackthorn berries, let alone actual gin. Plymouth, on the other hand, is made using the real fruit and their own gin, and it is absolutely delicious. 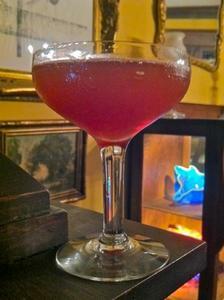 A Fizz—that sounds interesting, but sloe gin? Isn't that the sickeningly sweet red stuff from from when you were young and didn't know any better? Well, yes and no. And, that's a problem we need to overcome if we are to restore this drink to its rightful place as a refreshing classic. To get there, we need to understand a few things about our base spirit. Sloe gin isn't actually gin at all, or rather, it isn't gin anymore.